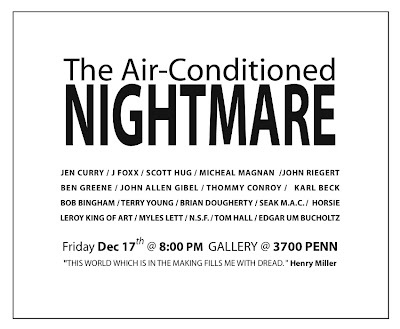 "The Air-Conditioned Nightmare" was a group art show organized by Edgar Um Bucholtz in winter 2004. It was installed at Thommy Conroy Works at 3700 Penn Avenue in Pittsburgh with much assistance from Thommy Conroy. The show was themed on a book of the same name by novelist Henry Miller. The book, written in the late 40s, is an often critical travelogue of America. Miller foresees the coming cold, homogenization of mainstream 1950s America, but also celebrates the quirky, individualist American underground. The walls of the gallery were covered with canvas and then collaboratively painted by many of the artists over the course of many days. 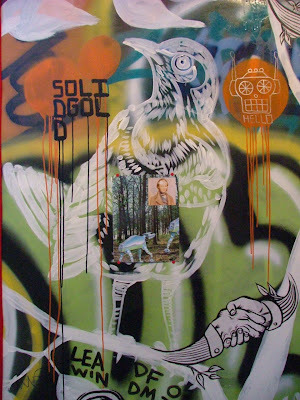 Additional artworks were then wheat-pasted or hung on top of the canvas.